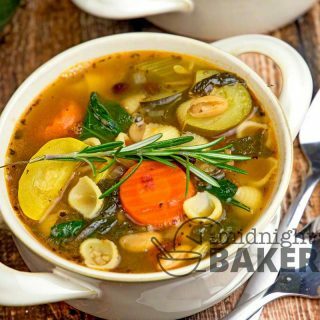 If you’re looking for a great soup that’s also a meatless meal, look no further than this minestrone. 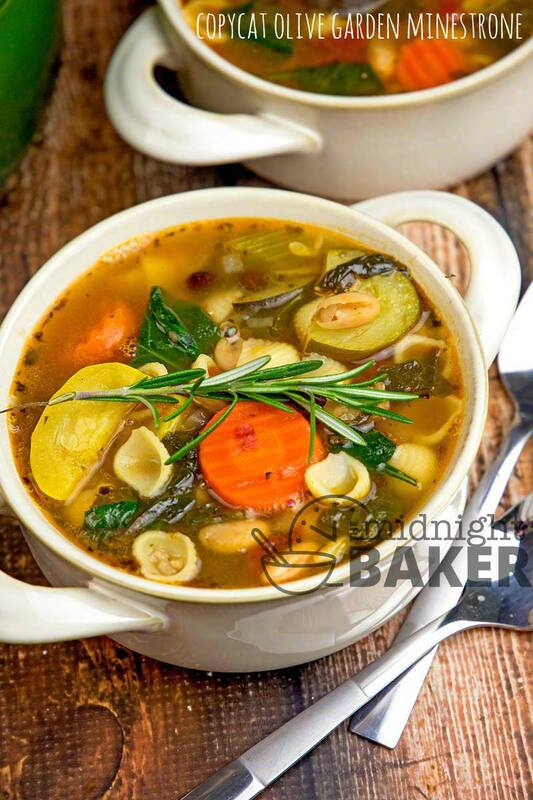 What could be better on a freezing-cold night than a hot bowl of delicious soup? 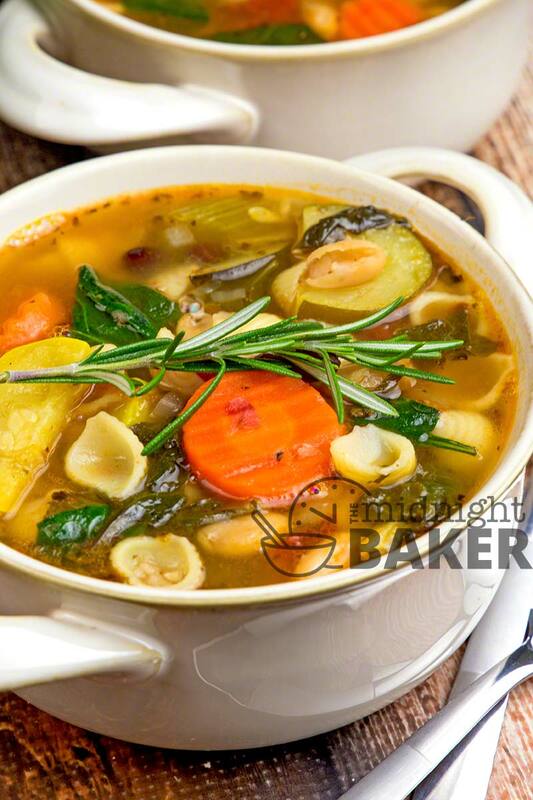 You cannot get better than this minestrone! 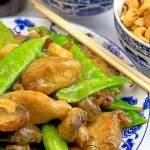 It’s chock full of beans and assorted veggies so it’s a complete and tasty meal in itself. Pair it up with crusty rolls or bread and you’re set. Even though there is no meat, this is a filling meal. However, it’s light enough in texture to not hang heavy on you. 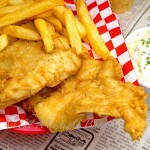 It will satisfy you but not make you feel uncomfortably full. If you grew zucchini and yellow squash in your garden this past summer and froze your excess, here’s a great way to use it! This soup calls for both green and yellow squash. If you don’t have any yellow squash “put up” then you can buy it, but you can always omit it and double the amount of the green zucchini. Also, if you canned or froze diced tomatoes, you also get to use them here. 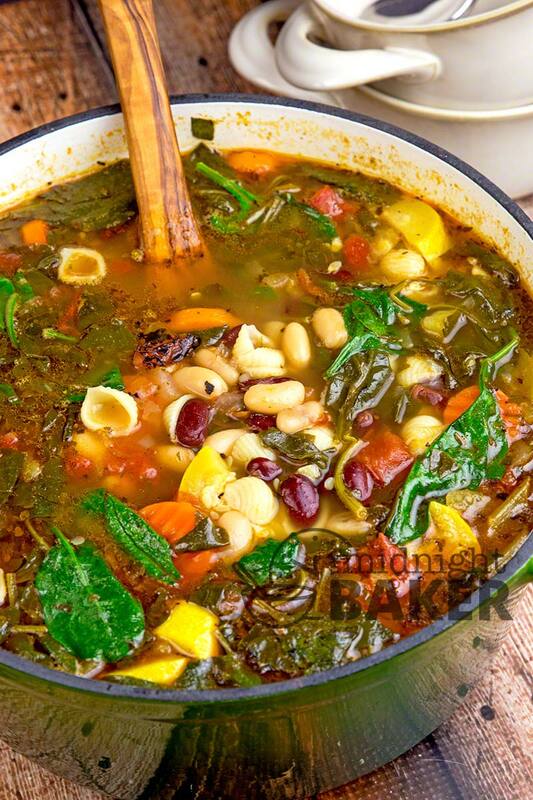 Of course, store bought is always an option, but this soup is just perfect for using what you preserved from your summer garden. 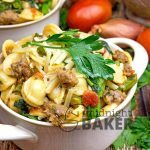 I used canned diced fire-roasted tomatoes in this for the deeper flavor, but plain diced or stewed tomatoes are also a good choice. Feeding A Vegetarian Or Vegan? 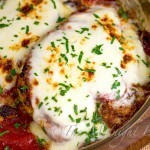 If you have vegetarian or vegan guests, this should be on your menu! While the original option contains a bit of cheese–which is OK for vegetarians–it can easily be omitted if you’re feeding a vegan. For the vegan option, make sure you choose a pasta that they can eat, so be sure to check the ingredients. You can always substitute rice for the pasta if you are unsure of the pasta ingredients. Heat oil over medium heat in a large (8-10 quart) stock pot. Add the onion, garlic, carrots, zucchini, yellow squash, parsley and celery. Cook over medium heat for about 5 minutes or until onion becomes translucent. Add the vegetable stock, water, cannellini beans, kidney beans, diced tomatoes, herbs and salt & pepper. Bring to a boil, reduce heat to low, cover and simmer for 30 minutes. Add the pasta and baby spinach; stir. Cover and simmer for another 20-30 minutes. Stir in the grated cheese. Serve immediately. I used Knorr concentrated vegetable stock (2 tubs) reconstituted with 4 cups water. If you cannot find Knorr, Better Than Bouillon vegetable stock may be substituted. Use 3-4 tbs reconstituted with water.